Silly me. I thought the monsoon season may have been coming to a close. I've described Bangkok's monsoons in a blog entry earlier this season. But, after experiencing two dry, lower humidity days and, dare I say, actually catching a chill as I stepped out of the pool, I wondered if perhaps this was the beginning of the "hot" season. (In Bangkok, locals joke that there are three seasons: hot, hotter and hottest.) And, although I've enjoyed the insane local rainstorms, life would be a bit easier to navigate without flooded roadways. After forty five minutes of heavy, steady rain, our street flooded again. And, not just surface flooding, but deep up to your knees flooding. A friend looked at me and said, "you don't want to go out in that kind of water." Apparently, she swears there are leaches dwelling in the floods along with other even more unmentionable elements. True or not, I was staying in for the afternoon and evening. 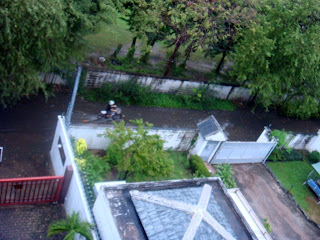 The picture above is taken from our family room balcony, overlooking our main gate and our street. That is a bicyclist attempting to pedal through knee high water on her way home for the evening. The water rose in forty five minutes, stayed deep into the dark of the night and evaporated by dawn. The picture at left is of a side soi that we walk from our home to the nearest Skytrain station after a typical early morning of heavy rain. I snapped this last week during our walk. This is a beautiful, simple dish to prepare and would make a festive holiday appetizer. Combine the coconut milk, salt, chili flakes, lime juice and zest of one lime in a large bowl. Add prawns and stir to coat. Cover and place overnight in refrigerator. Spread coconut on a large cookie sheet and place in a low heat oven. Watch closely and shake the pan occasionally until the coconut is golden brown. Remove from oven and allow to cool. Stir zest of remaining lime into the coconut. Strain the prawns to remove liquid and individually roll them in the coconut mixture. Spray a large saute pan generously with cooking spray and heat to a medium high temperature. Add the prawns and cook until opaque. This will take only a couple of minutes, but the ultimate length of cooking time will depend on the size of prawns you selected. Place on a serving tray and sprinkle the chiffonade of bell pepper over the top.